Team India cricketers were treated to a pōwhiri by Tangata Whenua at Bay Oval this morning to give the players an insight into Māori culture. India vs New Zealand 2nd ODI: Continue their winning momentum in Trans-Tasman region, Team India started their New Zealand sojourn in an emphatic manner as they registered a thumping eight-wicket win in series opening ODI on Wednesday. Moving on to their next destination, the Indian cricket team has shifted their base to the beautiful Bay Oval, Mount Maunganui which will be their pit stop for next two matches against Kiwis. In high spirits after the win, the men in blue were treated with a traditional Māori welcome at the Bay Oval on Friday. 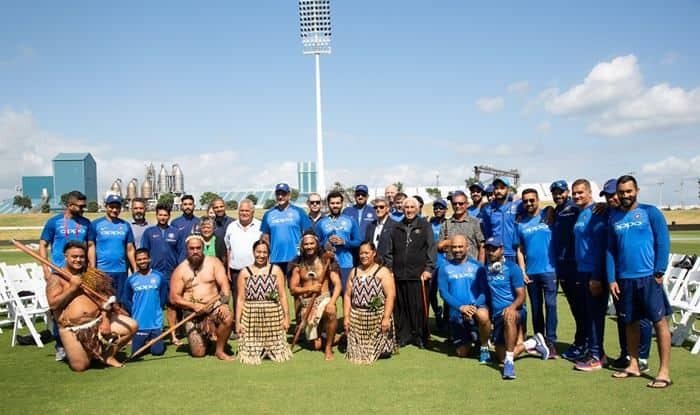 In absence of regular skipper Virat Kohli, vice-captain Rohit Sharma led the charge of Team India as the players received a pōwhiri by Tangata Whenua on Friday morning. The whole ceremony provided the visitors a first-of-its-kind experience and a deep insight into Māori culture. The team responded to a Wero before they were called on by a Karanga and after speeches and waiata, they wrapped up the formalities with a hongi. Manager of strategic Māori engagement at Tauranga City Council, Carlo Ellis, told 1 NEWS the experience was eye-opening for players. “It was really humbling for us to talk to some of the players and how excited they were to have that experience,” he said. “They were really open to whatever we might ask them to do – the hongi is a great example – so all the comments and the translations I was doing as the pōwhiri was going through, they just loved the spirit of the occasion. It’s the first time a pōwhiri has been performed for a visiting cricket team at Bay Oval – Ellis hopes it isn’t the last. “It’s connecting tangata whenua to Bay Oval staff so they are confident to ask for it when it’s appropriate. India will take on New Zealand in the second ODI of their five-match series at Bay Oval on Saturday (January 26) before the third ODI takes place at the same venue on Monday (January 28).